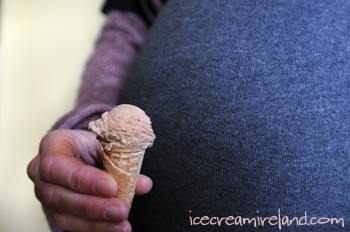 I’ve been worrying quite a bit lately, since the Venetian, my pregnant partner is not a big chocolate fan. She’ll eat white chocolate sometimes, she doesn’t mind milk chocolate, but she’s does not care at all for the dark stuff. For me, an insatiable chocoholic, the idea of offspring without real chocoholic tendencies was deeply troubling. A couple of days ago, J.P. made some milk chocolate ice cream in production, and I brought a tub home. The Venetian ate some, and the baby inside her, normally a gentle soul, went absolutely nuts. It kicked, jumped, and probably did ecstatic cartwheels, such was the commotion in the belly for the next half hour. The Venetian was astonished, and it was the first proud moment for this Daddy (to be). I think there is very little doubt that the chocoholic gene has been passed on. This is a delicate flavour for those with delicate tastes, when it comes to chocolate. Although we call the ice cream “Milk Chocolate,” we actually use 70% chocolate, just less of it. 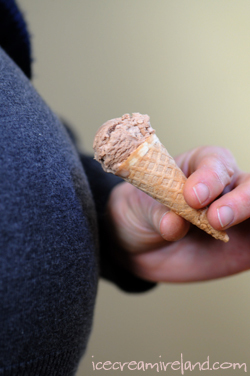 For our tastes, actual milk chocolate puts too much fat into the ice cream. No need for DNA testing Kieran, that’s a chocaholic Murphy there! lol..very nice and informative site.. i had a great time reading some of your post.. keep it up and hope to read more great stories ahead. Those cones are cute, aren’t they? They are very tiny, and we use them for tastings sometimes. What a lucky baby to be! Chocolate has become one of the most popular flavors in the world. It is a common ingredient in many snacks and desserts, including cookies, cake, ice cream, pudding, pie and candy. Just wondering is there any reason why you couldn’t add a small amount of arrowroot or cornstarch when you’re making the custard? This way the possibility of the custard curdling would be eliminated. I’m reasonably confident in my custard-making, having made ice cream so many times, but I was thinking that this would be an extra assurance. Also, a question about your tubs of ice cream that are available in shops – why is it that their ingredients differ from those on your website? They include extra ingredients such as emulsifier etc. This is not a criticism of the ice cream at all (I love it), I was just wondering how it changes the ice cream.